A good mattress is the key to good sleep. 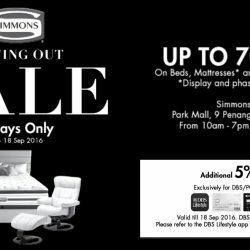 Hurry on down to Simmons Gallery Park Mall and enjoy up to 70% OFF Mattresses, Recliners & Bedding Accessories. SALE is now on till 18 Sept, starting daily @ 10AM. DBS/POSB cardmembers enjoy additional 5% off total bill! Note: SALE is on display and phase out models only. Terms & conditions apply. 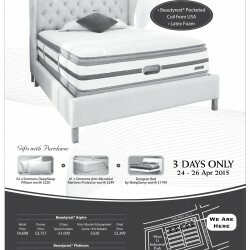 Check out the Simmons 3 Days Special at SleepSavvy from 11am to 7pm. Gifts with purchase: 2 x Simmons DeepSleep Pillows (worth $220) + 1 x Simmons Anti-Microbial Mattress Protector (worth $249) + Designer Bed by SleepSavvy (worth $1,799). While stocks last. Terms and conditions apply. Simmons Beautyrest, Now at Best Savings: Beautyrest Pocketed Coil from USA and Latex Foam! For 3 Days only from 24 to 26 April 2015.